Turning 30 is a big deal! Your twenties were a time of fun, freedom, and exploration, but now your 30 and over the hill. The 30 and Over The Hill Rosette Ribbon is the perfect way to mark the transition. The 30 and Over the Hill Rosette Ribbon is made from black material and includes several star decals. On the one tail of the ribbon is the words "Over the Hill". 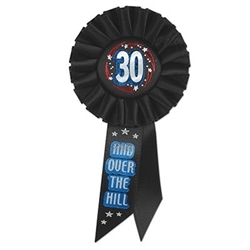 These ribbons are great as gag gifts for that certain someone who isn't so sure about hitting 30. Make sure to also check out the 30th Birthday Candles and Happy 30th Birthday Beads of Expression.